Star suvarna channel launching Triveni sangama serial, a new kannada musical subject from 6th february 2017. 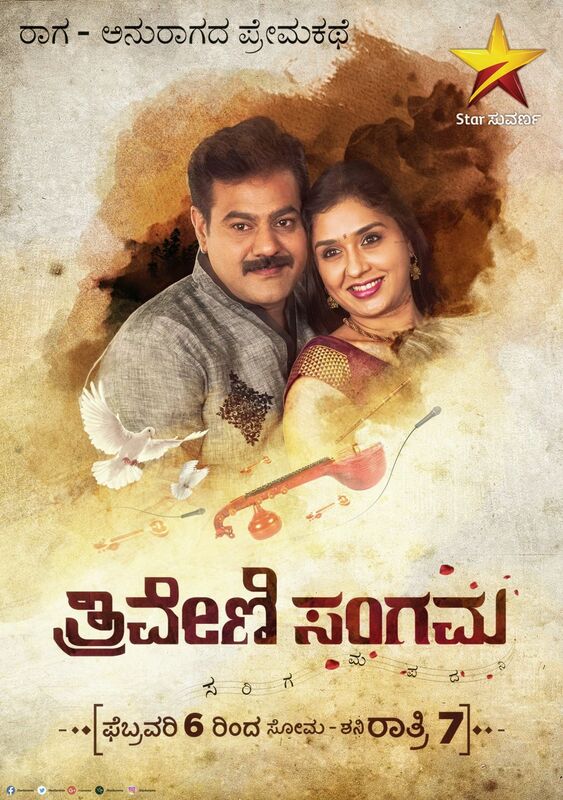 Anu Prabhakar and Rajesh Natarang are the lead pairs of Triveni sangama tv serial. Shashidhar Kote, Suresh Rai, Apeksha Purohit, Kempegowda, Guru Hegde, Malatishri Mysore, Shridhar etc are in other star cast. we have updated the launch date, story and other details of this kannada serial. every monday to saturday at 7.00 p.m is the telecast details of thriveni sangama serial. Star network’s malayalam channel Asianet also starting a musical subject Vanambadi from 30th January 2017. Triveni sangama telling the relation between Anu Prabhakar and Rajesh Natarang. How do they get together eventually through music keeping aside their differences is the main plot of this tv serial. She is short-tempered and he is tolerant, he is pure vegetarian and she is non-vegetarian. Star Suvarna is the leading channel of Kannadigas with many popular shows. As per latest trp ratings they are at 3rd positions. Hara Hara Mahadev Amruthavarshini, Avanu matte Shravani, Amma, Durga, Neeli, Geethanjali, Niharika,Super Jodi etc are some of the popular shows. Triveni sangama will be a different experience for the Kannadiga television viewers. Triveni sangama serial online episodes – Hotstar is the official and legal source to watch all star suvarna shows online. Triveni sangama will also available through hotstar app.